Cover– Now here is a cover I can stand behind! It shows the group of Robins standing together, gang style. The title smeared in blood at their feet as they face down an even larger mob. Art-Jorge Corona’s art makes for a very fluid and well choreographed book. Like last time it opened with action and is just totally fitting! Story– Duke and Company faceoff with the mob, before they are overwhelmed they make a daring escape. Duke passes out and gets left behind. He awakens to interrogation from an old man before getting a bike and a Robin Jacket along with coordinates to rendezvous with the team as they take on their first mission. 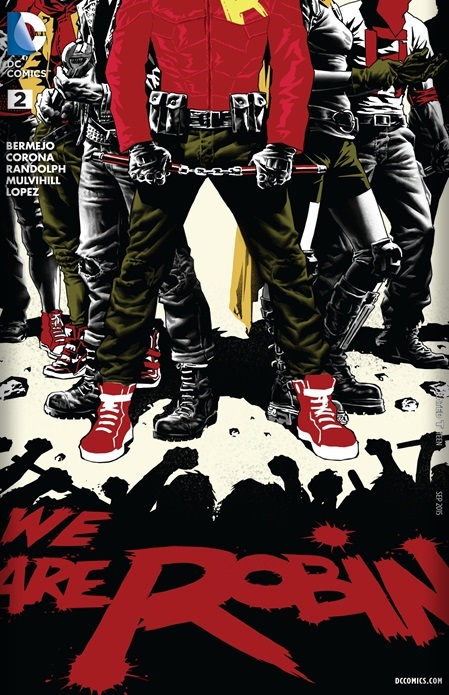 Black Hero– Duke Thomas officially joins the Robins! Yay! Characterization–Duke continues to grow on me though I would like to get to know the rest of the team at this point. Mystery-Who is their mysterious benefactor? Mission– I like the story of how each one was recruited and how their different personalities are being brought out. The idea of them saving Gotham from mass bombings is also street level enough to warrant the numbers this team is generating. No complaints from me, I’m sure many a critic will provide you with loads of reasons that this is the worst book on the shelves. Cheers!